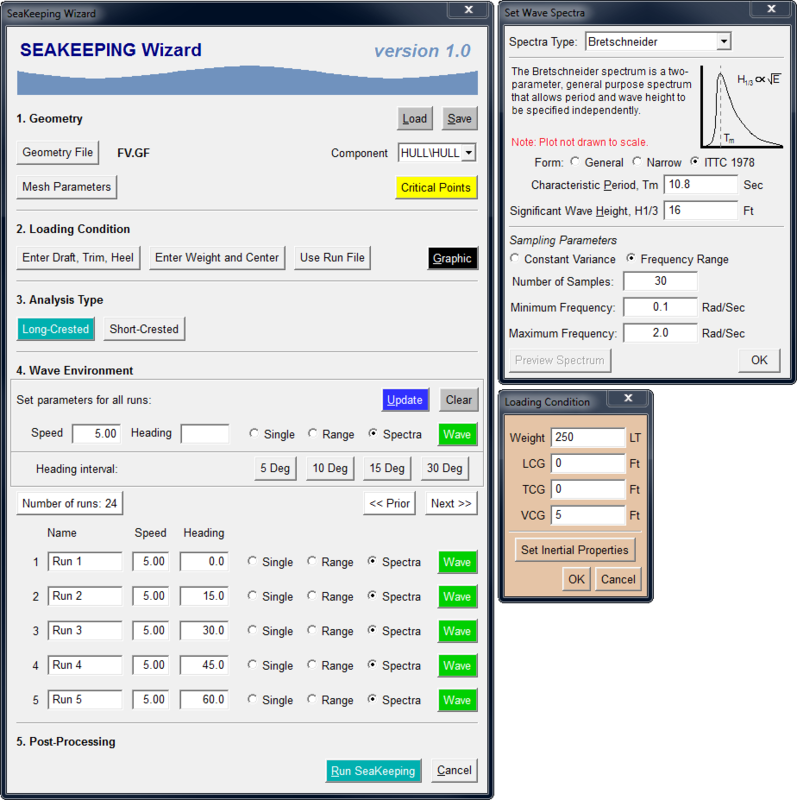 The General HydroStatics SeaKeeping Module "SK" is designed to provide the GHS user with an integrated, general-purpose solution for seakeeping and hydrodynamic analyses. SeaKeeping is the result of significant in-house development work, and while it offers many features that may be found in other motions codes, it is also unique in many respects. Integration within the GHS environment also means calculations may be performed using existing geometry files, loading conditions, and run files. This translates to minimal additional user input, unmatched flexibility in its market segment, and ease of use. Motion Studies: Compute 6-DOF RAOs, statistics, periods and amplitudes, with or without forward speed in long-crested or short-crested seas. Cargo, Rigging, and Sea-Fastenings: Forecast accelerations at rigging and fastening points, supporting the calculation of rigging loads, design of cargo fastening systems, and cargo shifting. Habitability: Estimate periods, accelerations, and MSI encountered under way in a variety of sea ways to ensure crew comfort and safety. Crane Operations: Estimate absolute and relative responses at crane booms and lift points and accelerations at crane bases. Accelerations may be given in Ft/Sec2, m/Sec2, or gravitational units "g's"
Wave Data: includes wave sample characteristics such as periods, frequencies, spectral ordinate, sample amplitudes, etc. Don't see a specific feature on the list? Contact Customer Support to inquire about current and prospective feature updates. SeaKeeping is always being updated and improved. Summary of general input parameters, including method type, meshing parameters. coupling parameters, and a table of seakeeping geometry part\component names and types. Table of user specified Critical Points, overall vessel CG, and any optional derived response points (SHW, MSI). Summary of overall wave/spectra type, wave samples, sampling method parameters, and numerically derived variance and significant wave height. Also includes tabulated wave period, frequency, LWL/WvLen, encounter frequency, ordinate, and amplitude for each wave component. 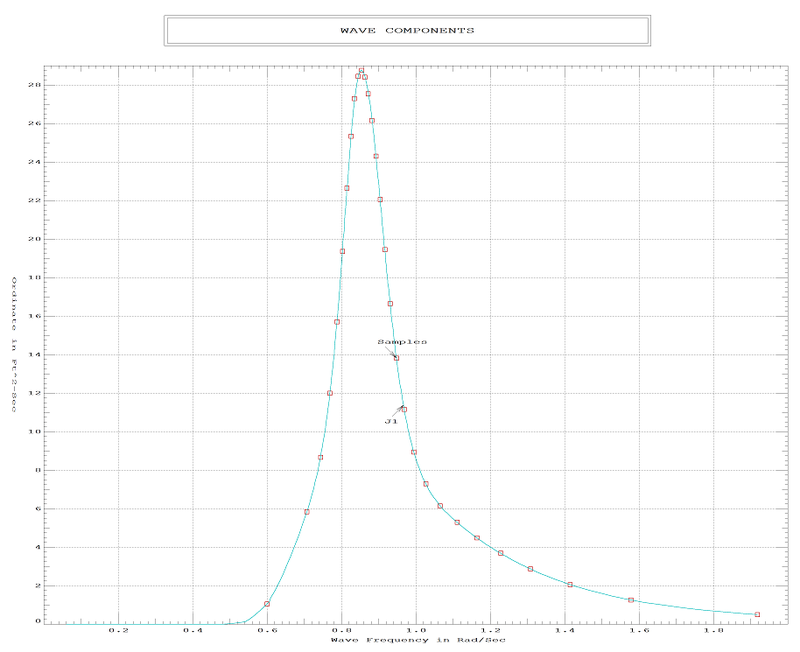 Tabulated RAOs and phase angles for all modes for each Critical Point. Also includes a plot for each mode, with results for all Critical Points plotted together. Tabulated response statistics for all modes for each Critical Point. Includes variance (m0, m2, m4), average periods (ZUC/Maxima), RMS, average, significant, average maxima, and optional confidence/interval extreme amplitudes. Table of user requested absolute response amplitudes for all modes for each Critical Point. Displays the response for the preceding case. 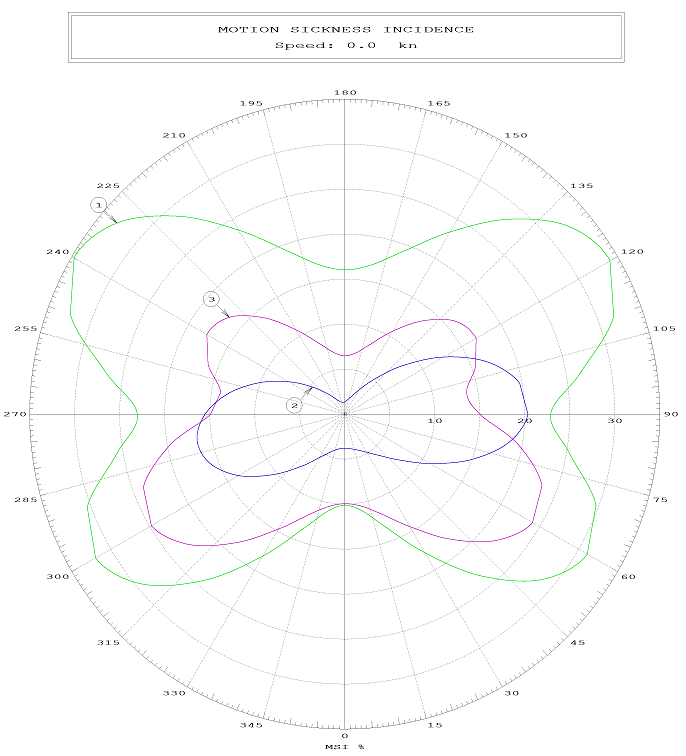 Polar plots for each user requested response for each Critical Point for all modes. Polar limit plots for each user defined dynamic limit over all cases. Table of overall user requested absolute response amplitudes and corresponding case numbers for all modes for each Critical Point. Displays the maximum over all cases. To help parse especially large runs, SeaKeeping offers optional case-specific or overall summary tables which display user requested position, velocity, and/or acceleration amplitude components in the x (Surge), y (Sway), z (Heave) translational directions, and the X (Roll), Y (Pitch), Z (Yaw) angular directions. These tables are an ideal "one-location" reference point for design values or initial review, and are always located at the end of each reported case. Automated response and limit polar plotting is also available to further aid in the review process. In addition to comprehensive reports, SeaKeeping offers six (6) optional comma-separated-variable (CSV) data files that include any of the information found in the report in a convenient form for input into spreadsheets, third-party programs, or further post-processing by run-files. SeaKeeping is a unique and powerful analysis tool. Below is a selection of white papers that provide a more complete introduction to the software, various use cases, and why SK is different from the competition. (Abstract) The General HydroStatics SeaKeeping software module, referred to in short as "SK", is Creative Systems� entrant into the world of hydrodynamics. Introduced in January of 2018, the module aims to provide users with an integrated, general purpose approach to seakeeping and hydrodynamic analysis. This paper is a moderately technical introduction for the interested individual or prospective SK user. After some introduction, the overall focus will be on the four (4) main areas that make SK unique in its class: Automation, Customization, Technical Capability, and Development & User Support. While some theoretical content is presented here, those specifically interested in a deeper mathematical basis of the module are invited to contact Creative Systems Inc. for a copy of the SK User�s Manual. If you are interested in testing the SeaKeeping Module, contact sales to inquire about a temporary license. We will work with you to set up a trial period that meets your evaluation needs. A number of core validation studies, including coefficients, forcing, RAOs, relative motions, and accelerations, may be found here. A collection of common questions from SK users may be found at the bottom of this page. Copyright (C) 2018, Creative Systems, Inc.